Dancing, & The essentials. - You don't know me. Hussey:When we say we have everything, we mean everything! Hussey's: The one-stop bridal shop! Sweet! Something for everyone: The father of the bride, the bride and the groom. "And they said Walmart had the market cornered on one stop shopping!" The Walmart near me has the guns and hunting upplies right next to the toy section. Ugh. hussey's General Store; You supplier for all your shotgun wedding needs! After losing the election, Sarah Palin decides to open her own business. 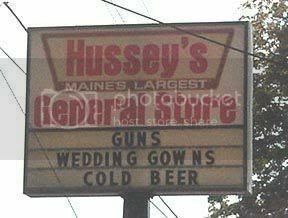 Hussey's: Your one-stop shop for all your shotgun wedding needs. Hope you don't mind me posting pics in your blog. I made 'em small.